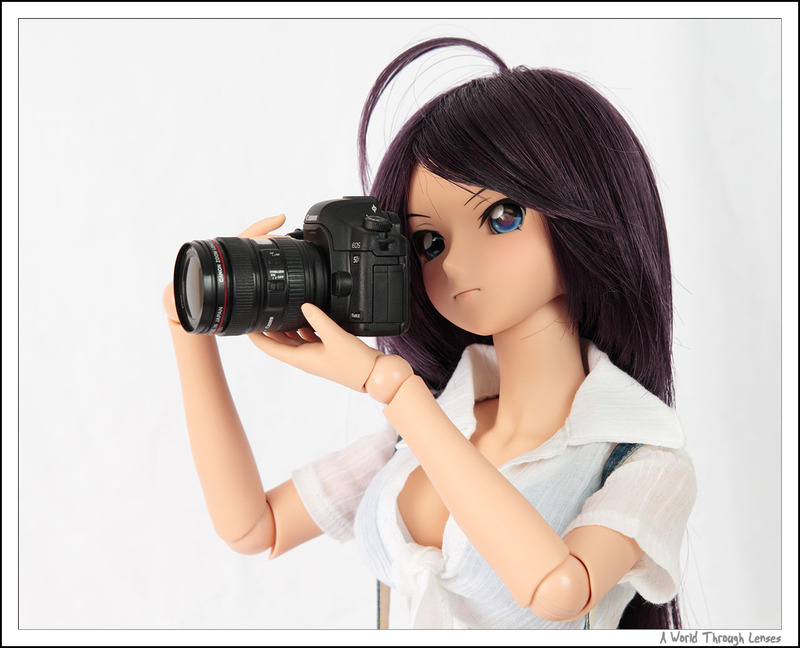 This is another one of my figure/doll photography 121 post. A few months ago, I’ve posted an article on how to produce a true black background without the use of any black background material and/or image editing software. I wrote about the black background because I find most people does not know how light works its magic in a photography sense. The people I talk to tends to instinctively come to the conclusion that if a photo’s background is black, then there must be something black behind it. If you have read my article, then you would see that a true black background actually resulted from a lack of light coming towards to your camera. Today I want to look at the opposite side of the gray scale — how to produce a white background? Well again a lot of people instinctively think that a white background is the result of placing some kind of white material behind the subject. Below is a photo that I took in front of a white fabric backdrop. However, when compared to the white frame that borders the picture, you can clearly see that the actual background is not 100% white. In fact if you load it into an image editing software, you will see that the background is somewhere between 96% – 92% on the gray scale. On the gray scale there’s only one white point which is at the very end of the gray scale. Anything that’s not 100% on the gray scale, or 255, 255, 255 in RGB value is not pure white. And 255, 255, 255 RGB value is what the background must be if we were to call it a true white background. Anything less is just a different shades of gray. The Touhou Project, for those who don’t know is a Japanese games series that’s primary danmaku (弾幕 which literally translates to bullet curtain) scrolling shooter. The game is developed by a single person: ZUN of Team Shanghai Alice (上海アリス幻樂団). It’s called danmaku because the screen is often filled up with bullets that you have to dodge in between. Even though I’m not all that good with these shooter games but I do love to play them. I find these games to be much more challenging and enjoyable than a lot of today’s games where graphics is everything while the game itself offers no challenge to the player in one form or another. 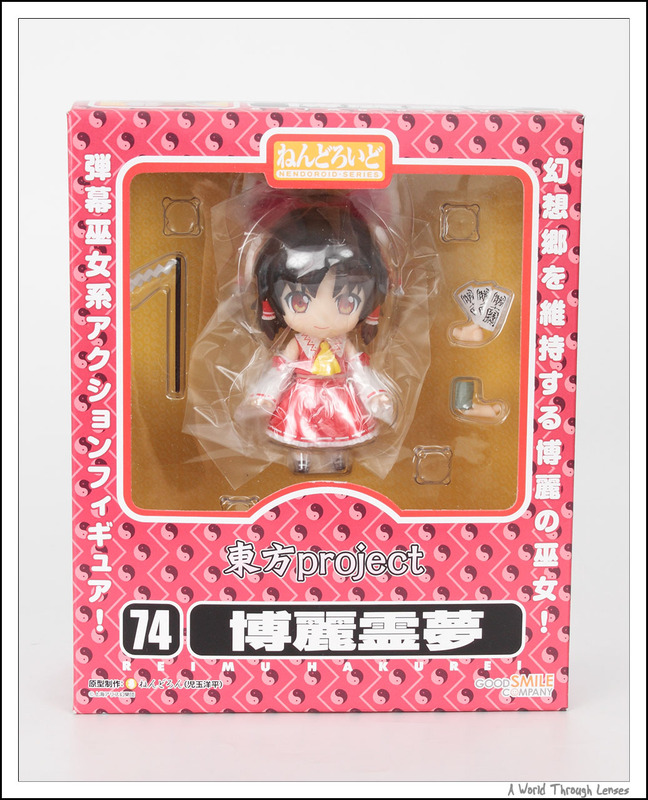 Good Smile Company started to make Touhou nendoroids in 2009. The first one is Hakurei Reimu, However, it was only offered during Comiket 76 (August 14-16, 2009) as well as on a few online shop that does not ship outside of Japan. It can also be ordered on a handful of Japanese online shops that also doesn’t ship outside of Japan. Because of that, I didn’t get my hand on it. Soon more Touhou nendorids were released. 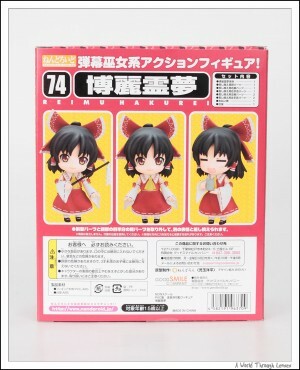 In January 2010, Good Smile Company released Hakurei Reimu’s friend Kirisame Marisa as a nendoroid. And with that, I finally geared up and bought both Hakurei Reimu and Kirisame Maris off Yahoo Japan Auction. 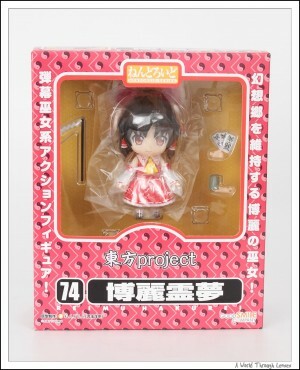 Another Touhou character that I liked, Remilia Scarlet, will be released as a nendoroid in September 2010. I’ve got my order placed with one of the online shops she’s available in and had it shipped to a package forwarding service in Japan so that I can finally get my hand on it for a more nominal price. Okay let’s start with Hakurei Reimu. Here’s her box shot. As you can see she’s pretty old. Nendoroid series #74. Nendoroid Hakurei Reimu by Good Smile Company. (ねんどろいど 博麗霊夢). Original sculptor Nendoron (ねんどろん). Released on August 2009 with MSRP of ¥3,000.